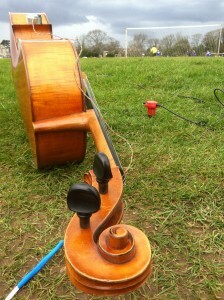 How can you resonate the sound of the ground through a double bass? 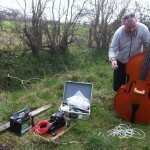 Bury My Love Like Treasure is a piece for string quartet, film and recorded sounds of the earth resonating through a double bass. 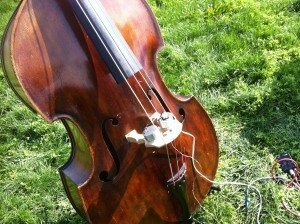 The sound picked up by a geophone is amplified and played into the bass via a transducer on the bridge. The structure of the bass resonates the sound. 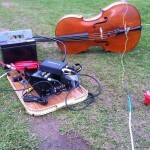 I was interested to see if and how the sound I had been able to amplify from the ground and hear through a subwoofer, would resonate though the wood frame of a double bass with a transducer placed on it. 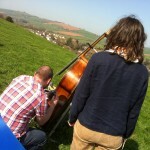 So I tried first with my cello on the Bristol Downs. These tests worked out and the sound was both audible and interesting. Both tests were done near roads where the impact of the traffic on tarmac I knew would have an effect on the geophone where I was using ( SM24 see http://www.geophone.com), and the battery powered car system with pre amp. (a MP-1 Sound Devices mic pre amp, 3000W amp and 12” sub at http://www.theloudest.co.uk/?sectionid=2&page=view_product&product_id=102 TL1023 ). We took the equipment to the very top of a hill at Thorveton in mid Devon where we had a spectacular view of the landscape and two fields away from a tiny road, a couple of miles from an A road and several miles from the M5. I was concerned that the geophone I had wouldn’t pick up sound brought about by the impact made by vehicles on the local roads; the roads being too far away. With two transducers on the bass, we listened. There were lots of sounds! The bass was SPECTACULARLY sensitive and seemed very much like an instrument of the nature around it. 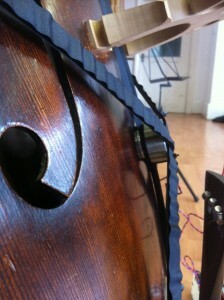 We had to adjust the set up by eliminating feedback that involved moving the geophone further from the bass. We also had to turn the bass to shield the strings from excess wind and put up a brolly to shield the instrument from the sun which was causing the bass to making sharp small bangs as it slightly and sensitively expanded in the heat. 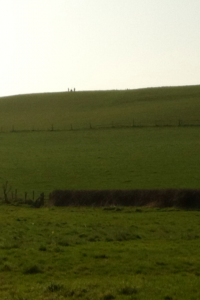 Looking up to the top of the hill you can just see two people and a double bass. The sound was quite visceral, varied, rumbling and deep. With out a spectrograph it wasn’t easy to say what frequency it was, but it was there, received and transmitted up through the solid, red clay hill in the middle of nowhere! 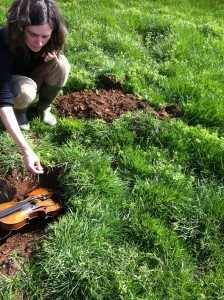 We recorded the sound of the soil being dug and the violin being buried in the hole. Listening carefully to these quiet sounds in that immense open space, I began to notice other quiet sounds from different distances. With the sun out, I enjoyed the colours and textures of the red earth, green grass, glinting sliver equipment and deep varnish of the instruments’ woods. The big space all around us and over our heads made me feel like we were sticking small and probing needles into a cushion. We were uncovering sounds from deep under the red clay terrain with the fragile ringing resonating of the bass – and ceremoniously covering up the violin. In the rehearsal studio the recorded ground sounds from the Thorveton hilltop were played into and were again resonated by the bass. Here is the sound of the ground as recorded resonating through the bass on the hill, now being played resonating again through the bass in the studio. This recording sounds rather less distinct than it did live due to the acoustics of the room – and my recording. 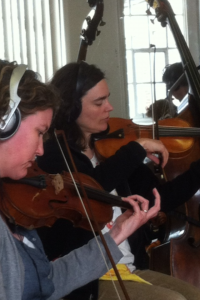 Here the string players are improvising, playing and vocalising with the sound of the ground. 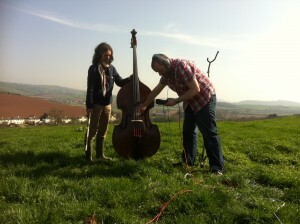 Here’s singer Jackie Oates singing a traditional song with the string players improvising and the sound of the ground.